Kelva…The king of good times for Vegayanites!!! Nothing like Anything…..so goes the tagline of the popular mobile brand Micromax and that perhaps also describes the energy packed and fun-filled weekend Team Vegayan had at Kelva beach Resort . 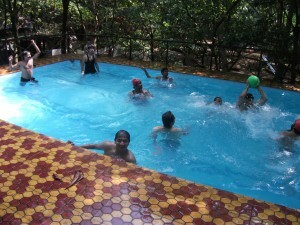 The resort, situated near Palghar, is on the beautiful, long and almost untouched beach of Kelva. The first look was impressive and it grew with time. With the rustic look all around, we had plenty of fun there. We stayed in nicely thatched bamboo huts. In no time we all jumped in the swimming pool. With trees all around the pool it was a perfect treat. We had a long and great session of water polo match. And that was just the beginning of fun. After having lunch we tried our hands on Pool Table, Table Tennis, Carom boards and what not. Soon it was followed by cricket and a football match on the beach (Yeah I know…we never stop when it comes to having fun!!!). The winning captain got some prizes which we all mistaken it for chocolates. After all the tiring games, in the evening, we finally settled down on Antakshari, which turned out to be very entertaining and fun. The place was lovely at night. Next day we started early. With few cups of tea, we were ready again to dive in the pool. 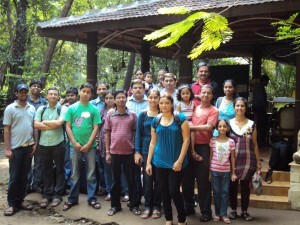 After having breakfast, we had group photo sessions. With our refreshed mind and exhausted body, we checked out to return to Mumbai for a lazy and relaxing Sunday to rejuvenate our body for a busy week ahead.